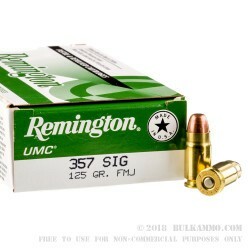 This 357 Sig ammo is made by Remington at their Lanoke, Arkansas plant and features a 125 grain full metal jacket bullet with a muzzle velocity of 1,350 feet per second. This ammo is great for target practice and competitions with your 357 Sig chambered pistol. Remington has been an American institution since their start in 1816 and puts over 200 years of research and development into all of the ammo they make resulting in reliable ammo that you can count on. 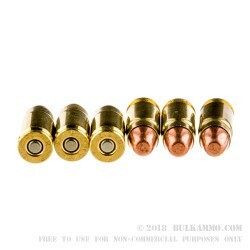 This ammo uses reloadable brass-cases that are boxer primed and non-corrosive. 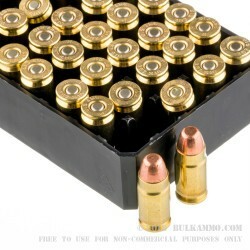 The Remington 500 rounds of ammo is an Excellent buy, especially considerating the price of .357 SIG target ammunition. The ammo burns relatively clean, and produced 5 shot groups under 2” at 25 yards. Second purchase of this caliber, totally reliable and functions flawlessly. Q: what is the foot pounds of energy of this round? A: Hello! Remington lists the muzzle velocity of this round at 1350 fps with a muzzle energy of 506 ft. lbs. Q: Why does 357 SIG exist? Why not just be happy with 357 or 357 mag. A: Unlike .357 Magnum, .357 Sig is designed for use in semi-automatic pistols. It allows velocities approaching or matching those attained by .357 Magnum with a nearly identical projectile, but (with a full-size handgun) offers a magazine capacity double that of .357 Magnum revolvers. Q: Will this ammo be sold in a 1000 count purchase in the near future? A: We offer products based on perceived market demand. We feel that current demand is met by this 500 count case, but we may change this in the future if demand increases.